Our commitment to our ethical principles and core values gives you the confidence and assurance you expect when choosing a strategic staffing partner. Our experienced team is proactive, adaptable and responsive to your immediate and/or long-term staffing needs. We have first-hand experience in our specialized areas, meaning you receive the right person for the right position at the right time. Our highly trained and knowledgeable team helps you complete and/or manage your projects on time and within budget. Our multidisciplinary approach eliminates the heavy burden of sourcing and vetting many staffing vendors. By serving as your trusted advisor and business partner, we enhance your competitive advantage. Our advanced technology tools enable us to provide necessary reports and data that improve your compliance, tracking and reporting. Our highly efficient and effective talent acquisition strategies help reduce your fixed costs, strengthen your employment brand, enhance employee retention, and provide a sustainable competitive advantage. Our advisory and consulting solutions enable you to effectively attract and recruit high quality candidates while protecting your investment in human capital. We are extremely active in the markets we serve, enabling us to keep you apprised of trends, regulations, and new technologies. By executing with integrity and remaining active in the placement process, we produce impactful and favorable results. 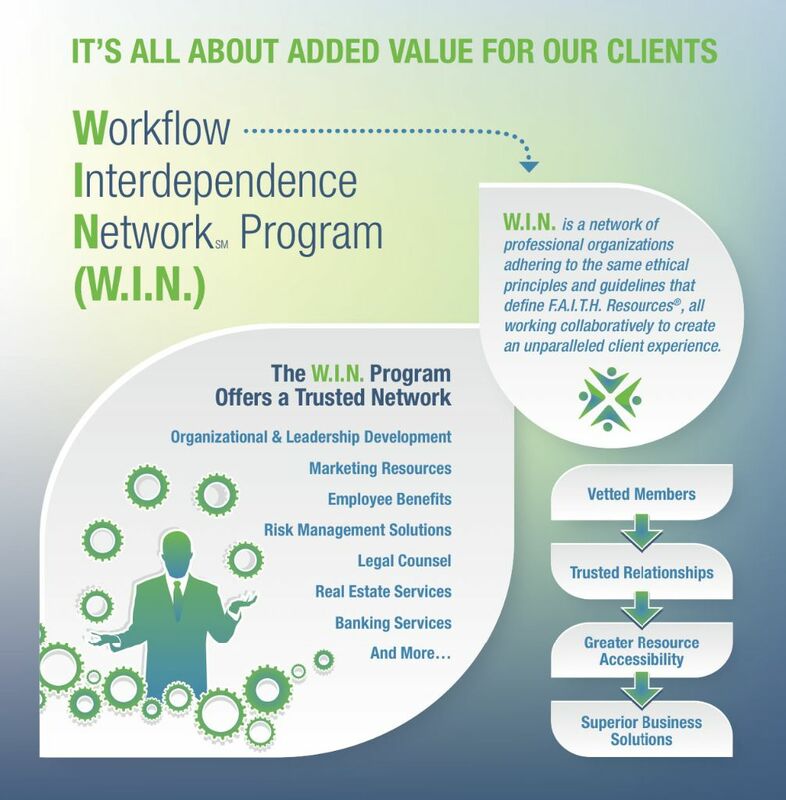 Our Workflow Interdependence Network (W.I.N.) Program offers access to a trusted network for greater resource accessibility. Our commitment to our ethical principles and core values gives you the confidence and assurance you need and expect when taking a leap with a job search partner. Our talent acquisition specialists are deeply committed to cultivating relationships built on a foundation of trust, authenticity, and mutual understanding. Using our proprietary interview consultation techniques, we are able to discern your unique skills and value proposition to ensure successful job placement outcomes. We invest the necessary time to thoroughly understand your career goals and provide sound career guidance, job market insights, and visibility to opportunities that match your search criteria. We also help you fine-tune your resume and provide interview preparation assistance free of charge. Because we are committed to your success and well-being, we stay in contact with you regardless of whether you are on a contract or in transition. We will continue to provide you with visibility, not only to our published job listings, but also to developing opportunities to targeted companies. Nevertheless, we will only forward your resume to prospective employers with your prior authorization. By leaping with us, you will have access to jobs not publicly listed, giving you the inside track and a distinct, competitive advantage over other job seekers. Because our clients often engage us on a retained or exclusive basis, you will be in a more exclusive pool of applicants, versus being 1 of over 100 applicants. According to a recent study conducted by the International Association of Corporate and Professional Recruitment, about half of all senior-level job changes are facilitated by search firms. This is exemplified by our experience as a trusted business partner to our clients, responsible for sourcing, vetting, and recommending the most qualified candidates. We have strong and long-standing relationships with hiring authorities, enabling us to successfully promote your strengths and unique value proposition, equipping you to interview in a more confident and effective manner, and reduce potential hiring scrutiny. By utilizing our proprietary interview preparation material, you are able to make compelling presentations to prospective employers. Items covered in our interview preparation consultations include how to articulate relevant experience and qualifications, information about the interviewer and company, and strategies to ensure successful outcomes. Our client vetting process includes researching what types of questions the client plans on asking and what topics will be discussed. This is invaluable information as it allows you to customize your presentation and have your answers well-prepared in advance. Because we are compensated exclusively by the employer, our value-added services and resources are free of charge to you. This gives us added motivation to place you in your new position, by preparing you for interviews and coaching you throughout the interview process. Our multi-tiered staffing model enables you to access a variety of employment opportunities available on a contract, contract-to-hire, and direct placement basis. If you are a sole proprietor or small business owner, we also have consulting opportunities available through our Workflow Interdependence Network (W.I.N.) Program.